I love Mealworms... I know disgusting right? But it's actually not. Before I got chickens, before my duck, even before my plants. I wanted Mealworms. I thought Mealworms were a good easy way to get in the habit of taking care of animals and they are! They are a smart, cost efficient step to start a farm. 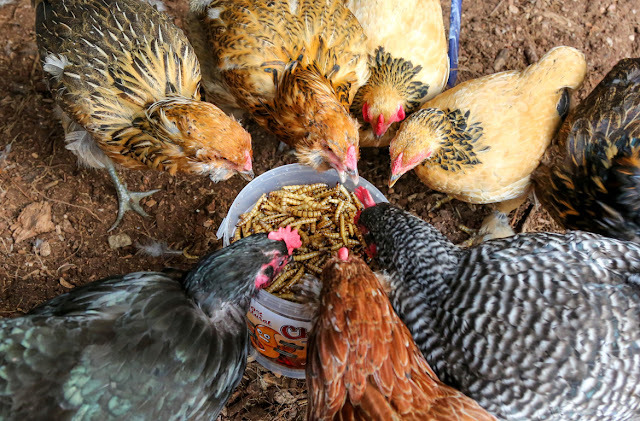 Mealworms are a chicken's weakness as well as ducks, fish, and mostly everything else. Mealworms are very easy to take care of. 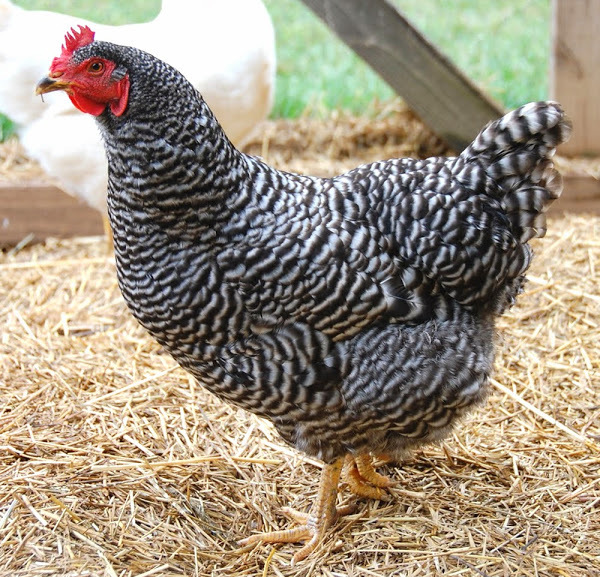 They are a free source of food supply and feed/protein for your backyard flocks. Mealworms only need a little area to live in. You can add adjustments to make it easier to care for them but, you can even just use a bucket as the basic limit of care for mealworms. Other features include adding a strainer/sifter bottom for the "poop" or baby mealworms to fall through. 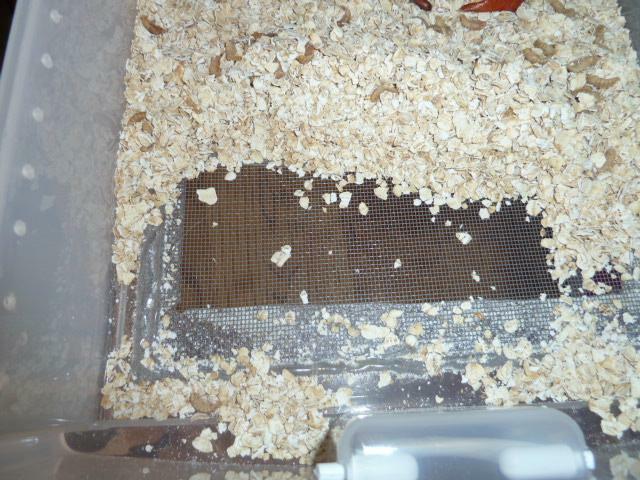 The next feature is to add multiple drawers (plastic dresser is preferable) for each different stage of the Mealworm. Mealworms are actually just a stage itself. They are the larvae of the Darkling Beetle (aka Mealworm Beetle). The Mealworm Beetles mate and lay eggs. These eggs are too small to see but in 4-19 days they will soon hatch into small Mealworms. These little Mealworm larvae, over the course of 8-10 weeks the Mealworm will spend its time eating and growing to conserve energy for the next transition. This stage is the most common stage to give to your animals as they are vulnerable and are an overpopulation of them. The Mealworm will molt and turn into an alien-like pupa. In 1-3 weeks the pupa will melt it organs and form into a Mealworm Beetle. One the pupa hatches a beautiful, black, traumatizing, nightmare enacting, kid tormenting Beetle appears. No, I'm just kidding, I love those stinkin cuties. They live 1-3 months as the final stage of their life. At this time, at 1-2 weeks they will start to breed and can lay hundreds of eggs in this time, restarting the life cycle all over again. Your Mealworms will need a space for protection. They need a dark area and can be susceptible to too cold and hot temperatures. A covered plastic dresser in your garage is ideal. You will need at least 4 drawers for this model you can have more if desired. Personally I would like a lot more drawers so I can be flexible and some spare drawers wouldn't hurt either. For the "bedding" the best material to use is oatmeal or grain. The Mealworms eat the "bedding" and exit it out as poop. This poop will need to be cleaned out and if you have a sifter it will add no extra trouble to you. As the Mealworms move around in the bedding they will sift the poop out themselves. The poop will fall to the next draw and it will repeat until it gets to the bottom drawer. The bottom drawer is the "waste bin" for the poop and should only be used for that purpose. With the bin like this it will be easy to clean. Besides the "bedding" your Mealworms will need water. Since they are too small you can't actually put water for them to drink. This must come from another food item like carrots or potatoes. There are other options but those are the ones that will last a while and won't rot. On the top drawer (or top two depending on how many you have) will be for the adult Beetles. The second to last drawer will be for the newly hatched mealworms. By moving the little Mealworms in their drawers further up the bigger they get, this will be the same as them graduating to the next stage of their cycle. In this example you have 6 drawers all together. You can change this example depending on the drawer space you have. Some people even extend their collection by adding another bin (with more drawers) to by at the same height but have more drawers. Another thing people do is make the top two drawers for the breeding beetles to allow for more production of eggs. The reason that the drawer is for 5-10 week old mealworms is because this is the stage to feed your chickens the Mealworm larvae. In the top drawers with the adult Beetles you will need to have nesting spaces for your beetles to leave their eggs. You can you empty toilet paper rolls, napkins, or egg cartons for this. 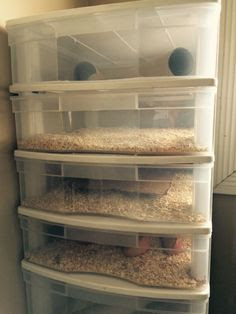 Doing this will make it easy for you to transport the too small to see eggs to the second to bottom drawer and start the cycle once again. It's important to know that the pupas don't eat or move so their is no need to add oatmeal (bedding) because this will just keep the poop from falling down. All you need to do is put them in a tray and wait for your new beetles to hatch!